Team Building: Who's in Your Herd? To schedule your corporate or association class or for more information, please contact us at 254.290.3446, email us at info@innovativehorizons.com or inquire online. Check the 2005 Schedule of Events or Register Online Now. 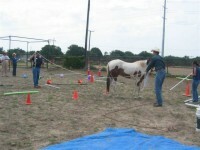 Why Use Horses in Human Training? * If you don't have the free Adobe Reader, click here. "This is a great way to refocus, re-energize and rebuild a team, group or any organization." "The E.A.G.L.E.S program is a great tool to get the concept of team- work across to everyone. You could see some of the team members do the same thing with the horses as they do in the office!" "This program gave me a great insight into how I operate in a group, as well as how several folks I work with operate. I've uncovered even more value in my corporate team members." Barbara Dewes, Senior Sales Consultant, Corporate Visions, Inc.
"This program really tests your abilities to work as a group and team and the individual lessons learned will be a benefit to me." "This program taught me how to build better relationships with co-workers and clients."